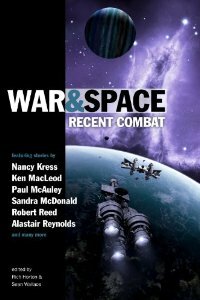 I recently learned that author Sandra McDonald (THE OUTBACK STARS) contributed an original sci-fi romance short story to the recent anthology from Prime Books, War and Space: Recent Combat (May 2012; edited by Rich Horton and Sean Wallace). For a full description as well as the table of contents, visit the spotlight at SF Signal. And here’s a link to the (much cheaper) Kindle edition. Two enemy soldiers, stranded together with no hope of rescue, seek peace. The short is about 2k words long and includes Sandra McDonald’s signature touches including an adorable sidekick. Despite the short length, she doesn’t skimp on worldbuilding. If you’re a fan of her Outback Stars Trilogy, then you’ll definitely want to check this one out. I’ve only read “Mehra and Juin” courtesy of the author’s generosity, but this anthology strikes me as a collection of interest for fans of military SF who also enjoy sci-fi romance. The roster of contributing authors is certainly impressive. It sure is interesting to discover where sci-fi romance turns up! Happy reading!